So far we’ve featured a number of great games in our “Thrift Treasure” series that may still be found for sale at the retail level. Today it is a little bit different in that this one is out of print and seems to only be regularly available on eBay. 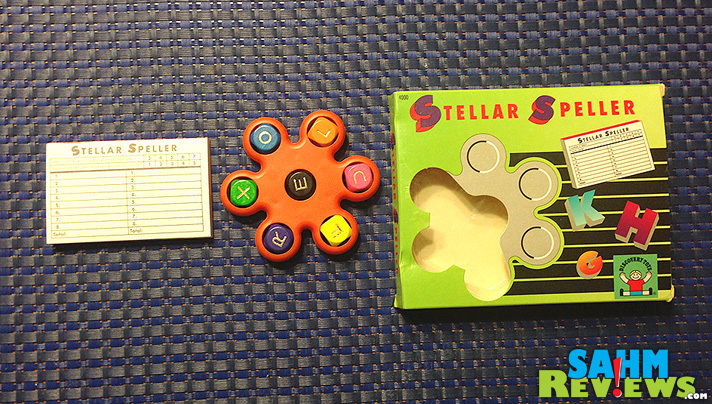 Originally sold via the in-home party company, Discovery Toys, Stellar Speller is another find-a-word offering with unique packaging that makes it also a great travel game. Pretty neat contraption, eh? Before the game begins, everyone agrees on how to ‘time’ a round. Set the microwave or stopwatch (not included) or simply have someone yell “STOP” when they get to eight words. Rushing to get your list complete is a nice strategy to shut others out of completing their lists. 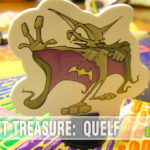 Once either time is up or one player has their sheet full it is time to score your finds. Three-letter words are the minimum (worth 1 point), 4-letter words are worth two, etc. Highest score wins the round. You can either play by number of rounds won or keep a running total to tally a final score. Because of the fewer letters (only 7 dice) and the possibility of duplicates, it really makes you stop and consider all of the word possibilities. It isn’t as face-paced as Boggle/etc since there are fewer letters to work with. 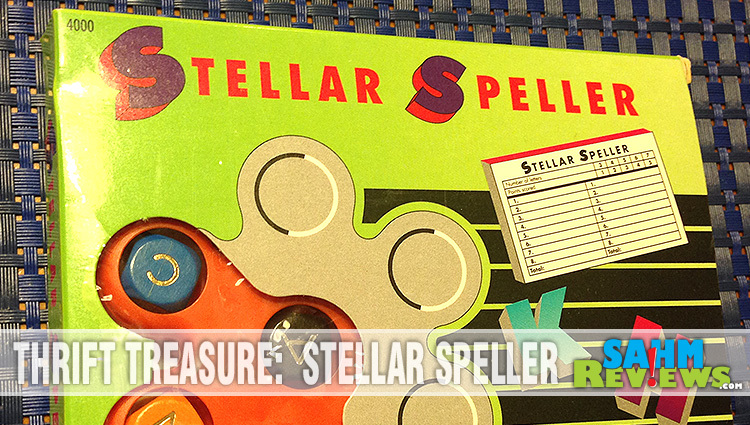 Stellar Speller probably won’t be a go-to game for us on family game night since we have other great ones to choose from (see Ambiguity), but thanks to its size will be a good one to carry with us on the airplane or car trip! Oh, and what did we pay for this ‘treasure’? Only 88 cents! This would be great for my oldest kiddos. Learning to read, building skills, this would be a great way for them to build on reading skills. I’ve never heard of this game – or Discovery Toys! You find such cool stuff in your thrifting adventures, especially for just 88 cents! It’s been so fun to do…maybe too fun. We now have enough games queued to last us through the end of the year! I have never heard of this toy before. I like the fact that there is less to lose. The kids always seem to lose something from a board game. The bonus is that it is a learning toy also. 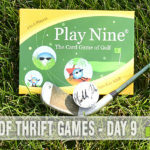 We have found some really fun games at the thrift stores too! 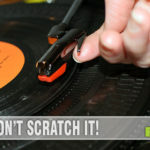 We found one called Chatter Matters one time that was a huge hit for less than a dollar! Love finds like this! You find some of the neatest things! I enjoy word games and don’t recall ever seeing this one. I think the dice spinner thingey looks neat, I’ve never seen another quite like that. This would be a challenging one to play I bet, like you said because of the fewer dice. I like word games though, because they are some of the few ones I can actually beat the rest of my family at! That is a really cool game, would be great for my girls that are just learning to spell simple words. Perfect for traveling too – thanks for the suggestion!! What a great game! Anytime you come across a game that incorporates learning and fun at the same time, you have hit a home run! This is such a great idea I’ll have to look into this game. Spelling is such a important aspect of learning for children. Some adults (I included) aren’t the best spelers uh sppelers, well, you know what I mean (LOL)! Thanks for the great post, I really enjoyed it. My Grandkids are not quite old enough for the Stellar Speller, but in a couple of years, I am sure this is one game we will want. I do have a friend who has a daughter that sure could use spelling help. I will pass this on to her. While I love the idea of it and it would probably be a great item to have, I have never shopped on eBay. I do not know why it is one of those sites I just do not visit or have a desire to. This would be a game I would love to play with my son, who I really think could use a lot of help in the spelling department! This reminds me of the hours and hours I’ve spent playing Boggle in my lifetime! Looks like a really fun game! Thanks for sharing! That sounds like a fun game that I bet both of my boys would like. I love to bring things like this along for them to keep them occupied for when we travel. This looks like a game we’d pull out on those late nights when you’re all together with family you haven’t seen for a while. So much fun to be had there! Loved that game as a kid! Congrats on a great find! Great idea to strengthen spelling skills in the classroom too. And yes great for traveling!! My son would really enjoy playing this game. I would enjoy the fact that he will not only have fun but learn at the same time. It certainly sounds like a constructive game. what a great find and cool game. Cool find. I have never heard of it. But I agree that will be a good travel game. Very cool! Buy used, save the difference! Great bargain! For less than a buck, it’s totally worth it. I can see that it would be fun on a plane or in a car, like you suggested. This game looks like a lot of fun! I love educational and fun games. What a neat game! It’s such a cool find! I have started looking for older games during visits to thrift shops. So far nothing quite as cool but I can hope. I love finding thrift shop gems that are oldies but goodies! I love, love, love spelling and word games! I always loved playing games like this when my girls were little. I love educational games that promote literacy and language acquisition. This one looks really good for that. Looks like Fun. Kind of reminds me of Boggle. I love word games. For .88 cents? I think it’s a great deal! Like you say, it would be a nice game to take along during trips since it is so small and compact! I never heard of this game. This would be great for my older kids! This looks like an excellent game to take along when you are traveling with little ones. It provides entertainment and also easy to pack and not lose any pieces. This is cool – fun and interactive – not to mention it’s educational too. Sounds like a really great game. My 9 year old would enjoy this. 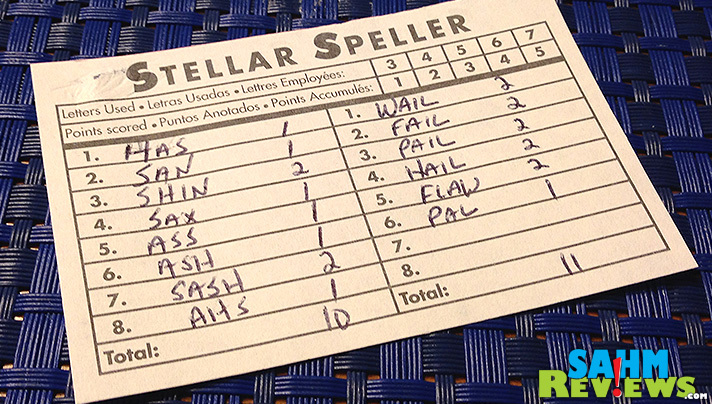 He loves to spell and would think he’d win every time. I have never heard of this game; sure does look like fun! I like games that travel well. This one sounds like it’d be perfect for long road trips. This looks like such a great little travel game! I’m taking my toddler on a trip next week, and while he’s too young for something like this, it’s always good too keep an eye out! What a neat find! I don’t think I ever heard of this game. It looks like so much fun. This kind of reminds me of the game Boggle that I used to play as a little girl. I think this is a fabulous way to help children with their spelling! Certainly looks fun! I’m used to plain old Scrabble, but this looks just like an updated version of it. This is a great product to help kids learn to develop their spells skills. Plus it’s a fun game. THis sounds like a really fun game. I think this would be a great game for my kids. I remember this from Discovery Toys! I’m so out of the loop on in-home parties. Reading about all of these makes me want to start having more of them though. My family loves to play games, and this one looks like a lot of fun! Might be just a bit young for Bubbles, but it would be a good teaching tool for her. She’s anxious to learn to spell. Wow! This sounds like a fabulous game! I think our kids would love playing it! I love that there aren’t a ton of pieces to the game. We’re always losing our pieces! This looks like a great game for my family. We love games, especially word games. Scrabble is a favorite! What a fun game for the whole family. 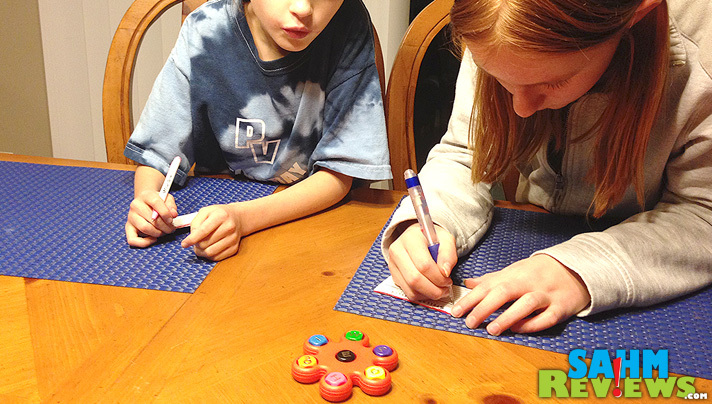 The younger kids can hone their spelling skills and the older kids can test their brain power! This looks like an awesome game. I would love to have it for my classroom.